It begins with a fateful meal at Wheelers restaurant in London. It ends with the Boris Rap. 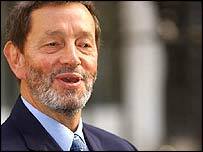 And in between we see the rise and fall of David Blunkett in song. It is the perfect vehicle for a musical - strong characters, heightened emotions and a barely believable plot. The strange mix of personal crisis and political downfall brought by the affair between the former Home Secretary David Blunkett and Kimberly Quinn, the publisher of the Spectator Magazine, has been turned into an hour and a quarter of musical comedy and tragedy. Composer, MJ, says "music takes away the gossip and adds heart and feeling and soul". Rather than mocking his predicament she says it shows there are real people behind the headlines and she hopes he will get a chance to return to the Cabinet. And if that is not enough, there is also a romantic sub-plot featuring another politician, Boris Johnson, the Editor of the Spectator, and all the real-life protagonists are invited to the first performance. The tangle of complicated love lives, newspaper revelations and political downfall means that many of the best lines come from real life. The producers, though, doubt they are going to turn up to see what is, after all, an entertainment based around their own personal torments. However, the writer Ginny Dougary says they ought to be "flattered", and feels they will enjoy seeing themselves sympathetically portrayed. Mark Perry, who has impersonated David Blunkett on the BBC Radio 4 comedy, Dead Ringers, is playing Mr Blunkett in the show and says it has been a chance to get at the "psyche" of the former home secretary. Meanwhile, the tangle of complicated love lives, newspaper revelations and political downfall means that many of the best lines come from real life. Ginny Dougary, says phrases including "the Socialist and the Socialite", a "total inverted pyramid of piffle", and "I always wanted to sleep with a blind man" all came from the mouths of the people concerned and meant much of her work was done for her. The show takes us through David Blunkett's childhood, Kimberly Quinn's rise to social success and Boris Johnson's trip to Liverpool to apologise to the people for remarks about the city that had appeared in the Spectator. However, the show has yet to find someone willing to put it on. The performance at the Soho Theatre is a one-off for the theatre world in the hopes of finding some financial backers. If they do get funding they are going to head to the Edinburgh Festival. Their hope is to emulate the success of another musical show based on a real person, Jerry Springer. This, however, has rather less swearing and blasphemy but has a stirring story, a working class boy who succeeds despite the obstacles of poverty, disability and bereavement but is then brought low by love. There is also another issue, further developments or revelations. The shows writers say they are ready to change the musical if things change.